Tagbots, made with HUB-ee wheels and our Shield kit. Another quick video - this uses incremental counts from one wheel to set the speed of the other. As you rotate the wheel on the left, the quadrature counter will increment up or down, and this value is then used to set the speed and direction of the wheel on the right. Just finished work on the alpha version of an Arduino example sketch to go with our forthcoming Prototyping Shield for Arduino. We hooked up two HUB-ee wheels and used the in-build quadrature sensors to drive each wheel forwards and backwards by two revolutions. The video shows the software running with three different motor speed settings: 50, 150 and 250. So I've made plenty of differential steering and skid steering bots using HUB-ee wheels but how about something more sophisticated ... This "mini Mars rover" has servo steering and rocker suspension. 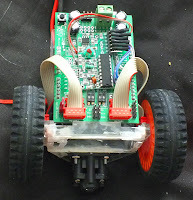 One problem I hit was the lack of pins on a normal Arduino, you need three to control each wheel and I wanted to use servos for steering - there just aren't enough pins to provide four wheel independent drive and steering so this version is slightly "under actuated". The wheels on each side are driven in sync and have a single servo to steer them. It can be a bit hard to imagine what speed your bot will go at with different ratio gears so we had a quick drag race between two bots (well, they hardly qualify as robots) so you can see the difference between the 120:1 and 180:1 HUB-ee wheels. We have made a small number of HUB-ee wheels available for sale through our first UK Distributor Technobots. If you order now you should get them in time for Christmas! There are only a handful available so get them before they go - we won't start full production until the middle of January. Uploaded a quick video of a little robot - called Flat Bot because it's ... well ... a bit flat. No, we didn't step on it, it is just us showing off what you can do with out HUB-ee wheels. We have just uploaded a brand new website, and in a few days we hope to put up details of our first products.